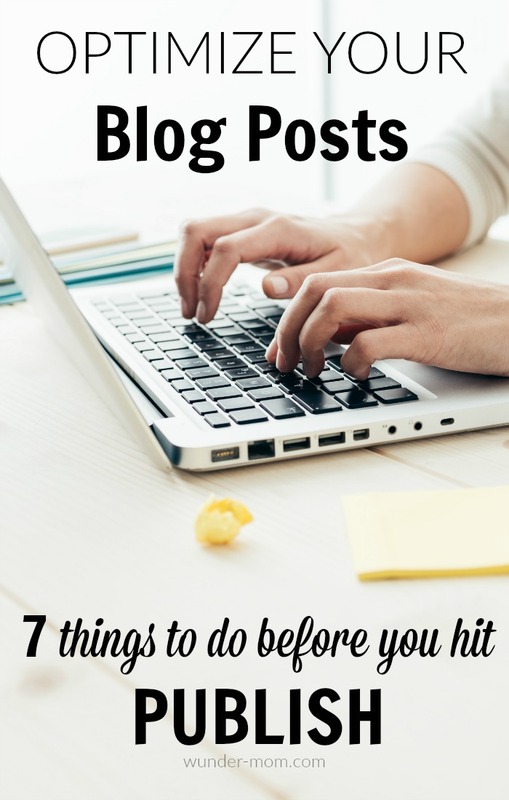 Optimize your blog posts: 10 things to do before you hit publish. Blogging has become one of the best ways for moms to work from home, on their own time. I love my “job” for that reason – I can stay home and raise my kids AND earn an income to contribute to the family. Since I am a busy mom of four, working from home, I want to make sure that I am getting the most out of everything that I publish. My time is very valuable so when I sit down with my laptop to write a post I want it to be optimized and set up to bring in traffic and income potential. Before I hit publish I make sure that each and every post is optimized to it’s fullest potential. What do I mean by optimized? Well, I want the post to work for itself. There is nothing worse than hitting publish and watching a post fall flat. So when I publish I want to make sure that it is shareable and that it is going to be a source of both traffic and income for me. I have created a checklist to make sure that I give each post I write attention to detail and I don’t leave anything out. Sometimes I get caught up and so excited that I just want to hit that blue publish button before it’s ready and that is a big mistake! I learned the hard way that it is much easier to run through the checklist and make sure my post is optimized from the beginning instead of going back and trying to optimize later down the road. 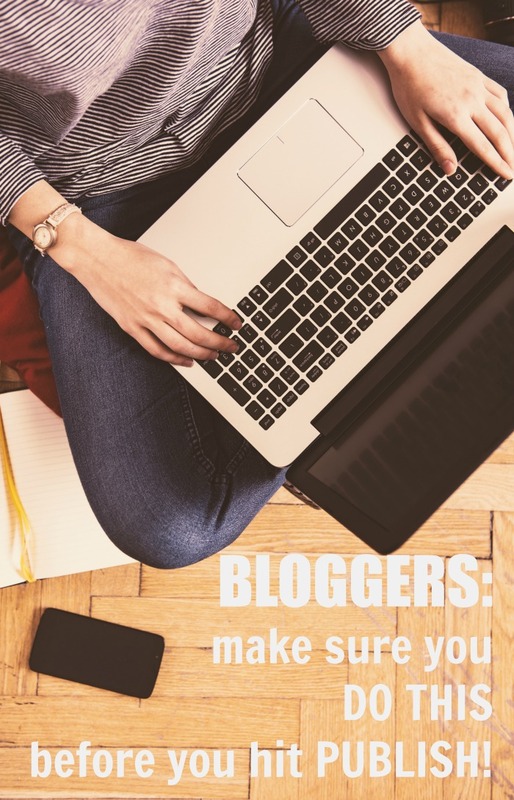 I have HUNDREDS of posts that need to be updated from my early blogging days – before I really understood how to make a blog work for me instead of the other way around. Make sure that your post has multiple crisp, clear, attractive pin images. Yes, multiple. More than one if you can. You want your pin images to be long and attention grabbing. If you are publishing a craft tutorial or a recipe post create the “hero” image and also a collage of the steps. Play around with different images and sizes to see which works best. With multiple images you are giving your article more ways to be seen – double your bang. Always add an affiliate link, or two. You might be thinking, but this post doesn’t have any products in it. It doesn’t matter. Even parenting posts can have affiliate links in them – link to products like related books, or e-courses. When creating craft tutorials, link to the materials you used in the crafts. If it’s a recipe, link to your favorite kitchenware and small appliances. Use your imagination and think of things that you, personally find useful and relatable – chances are, someone might be looking for that exact recommendation. Link to your own posts where it makes sense. Find key phrases and link to another post that is relevant. For example, I have a post about why my family isn’t crazy for having four kids – everytime I write key phrases such as “mom of four” or “busy mom” I link to that article. Another example is linking to related recipes or tutorials. If you are writing an article about a crock pot soup and you have another crock pot recipe link to it using key words within your article. Manually post your related content in your blog post. Sure plugins are nice and easy but they often go overlooked, especially if they are mixed in with a barrage of ads and information at the bottom of your post. I prefer to post big clear clickable images at the bottom of your post to catch the eye of your reader. This is KEY. Your ultimate goal is to capture that reader and get them to come back time and time again to read your information. I’m not a fan of pop-ups, personally so I keep a header bar at the top of my page to catch the eye of the super fan. You can also try a box at the bottom of your posts for those who make it all the way to the end – chances are they enjoyed the material and will want to come back for more. And my personal favorite – the email opt-in requirement for any downloadable materials. If you make printable materials, require a newsletter sign-up in order to receive them. Or, create a printable freebie just for those who sign-up. Break up your post into bite-sized chunks of information with headlines. Using headlines within your post make it easy to read and each of those headlines tells google “hey, this is important information, read this first”, which is great for your over-all SEO. Always end your post with a call to action. The goal is to keep them as a reader for as long as you can. You can post a question encouraging comments on the post, direct them to other related posts with your clickable images, or have a way for them to sign up to your newsletter. However you do it, don’t hit publish until you’ve called them to action. This is a group of both new and experienced bloggers, all moms, sharing ideas and information with one another. I’d love to have you!